NEW YORK (AP) — They crowded around the White House conference table this past week, lawmakers from California, Connecticut, Texas and Florida, eager to share their state’s painful experience with gun violence. One key state was not represented. No one from Nevada, home to the deadliest shooting in modern U.S. history just five months ago, attended the televised discussion with the president. But in the politics of gun control, even those who say the least have considerable sway. Despite a clamor for action in the wake of the Florida school shooting, a powerful group of vulnerable lawmakers — both Republicans and Democrats — have pointedly avoided the national conversation about guns. They often choose strategic silence rather than get crosswise with the National Rifle Association’s die-hard supporters on the right or the growing movement of passionate gun control advocates on the left. The office of Nevada’s senior senator, Republican Dean Heller, would not say why did he did not attend the White House meeting. Heller, who is facing a tough re-election fight, has avoided the spotlight in the subsequent days as well, declining to address specifics about his positions on gun legislation. The White House did not respond to requests for comment about whether Heller was invited to the event. The state’s Democratic senator, Catherine Cortez Masto, and its three Democratic representatives also did not attend. Heller spokeswoman Megan Taylor declined to say whether the senator supported universal background checks, raising the age for gun purchases to 21, or provisions to ban high-capacity magazines and assault rifles, all ideas tossed out by lawmakers or President Donald Trump in recent days. “He looks forward to continuing discussions with his colleagues as Congress explores ways to enhance compliance with existing law and keep our communities safe,” Taylor said. Heller has signed on to legislation known as “Fix NICS,” a modest measure supported by the NRA and intended to encourage better participation in the National Instant Criminal Background Check System. It was one of the few gun bills to find bipartisan support and appeared poised to move ahead, only to be sidelined. Senate Majority Leader Mitch McConnell, a Kentucky Republican who has said little about the gun debate in recent days, said Thursday that no gun-related legislation would be heard in the coming week. Without this silent majority’s support, there is little chance for significant gun control legislation to become federal law, no matter how loud the outcry from high school students and others who are pushing for action. The stalemate infuriates Ryan Works, a 40-year-old father of two, who hid under a table at an October concert in Las Vegas as a gunman shot and killed 58 and wounded more than 800. A Republican, Works offered an emotional message to Heller and elected officials in both parties who are reluctant to take on gun violence. 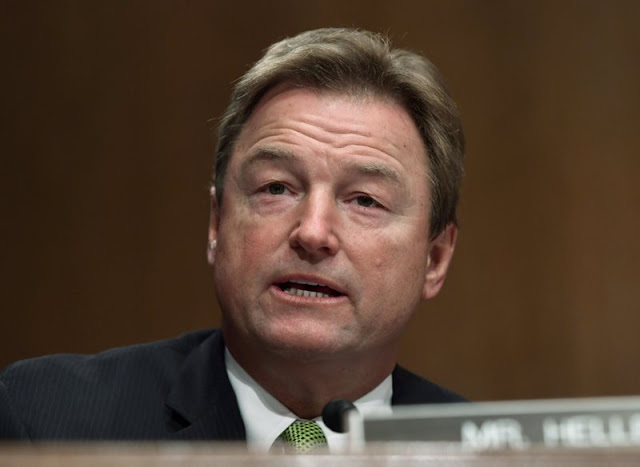 Heller’s muted response at an extraordinary moment highlights the weight of his political predicament. Running for re-election in a state Trump lost, he must win over a significant number of independents and moderate Democrats in November’s general election to earn a second term. But first, he must survive a primary challenge from a conservative firebrand in a state where GOP primary voters value gun rights above almost all else. The challenge is easy to see in recent polls. Two out of three adults in the United States want stricter gun laws, CBS found in a poll conducted a week after the Feb. 14 shooting in Parkland, Florida. But among Republicans, 54 percent want gun laws left alone or made less strict. That’s likely why the most politically vulnerable elected officials have kept their heads down, leaving the heavy lifting to elected officials facing less political risk this fall. On the Senate floor this week, blue-state senators such as Vermont’s Bernie Sanders, Massachusetts’ Ed Markey and New Jersey’s Cory Booker offered fiery speeches about gun violence. Pennsylvania Sen. Pat Toomey, a swing-state Republican whose current term ends in 2022, re-emerged as the face of the push to expand background checks. Arizona Sen. Sen. Jeff Flake, a Republican who is retiring at the end of this year, was partnering with California Democratic Sen. Dianne Feinstein on legislation to move the age to buy long guns to 21. Those Democrats running in Republican-leaning states this fall were far less conspicuous. North Dakota Sen. Heidi Heitkamp and Indiana Sen. Joe Donnelly, both Democrats running for re-election in states Trump won handily, have said nothing about gun violence from the Senate floor in recent days, but made statements honoring constituents who had recently passed away. Heitkamp supports the “Fix NICS” plan and co-sponsored a bill that would prevent those on the terrorist watch list from buying guns, her spokeswoman said. The senator has previously opposed so-called bump stocks, which the Las Vegas shooter used to increase the firing speed of his semi-automatic rifle. But the spokeswoman did not clarify whether she would support universal background checks, higher age limits, or provisions to ban high-capacity magazines and assault rifles. Similarly, Donnelly, who previously voted for universal background checks and backs “Fix NICS,” said little more about the issue when pressed for specifics. “I believe that Congress should take steps to reduce gun violence, while protecting the rights of law-abiding citizens,” he said in a statement. At the White House meeting, the Democratic Party’s most vulnerable 2018 class was represented only by Sen. Joe Manchin, a former West Virginia governor, who encouraged the president to help promote the so-called Toomey-Manchin plan to expand background checks. Trump seemed to embrace the proposal during the Wednesday meeting, but he hasn’t mentioned it since a Thursday night meeting with the NRA, which opposes the plan. Don’t expect Heller to mention it either. Should he win his primary, he will likely face Democratic Rep. Jacky Rosen, who isn’t shy about her support for virtually every gun control measure on the table. She was quick to note Heller’s low profile in the debate. 0 Response to "Vulnerable lawmakers answer a noisy gun debate with silence"